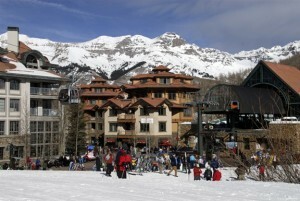 Telluride Mountain Village Real Estate. Homes and Condos. Ski property. Contact Ray Bowers with questions about Mountain Village Real Estate. By and large, the Mountain Village inventory of homes for sale is huge compared to previous years so there has been some downward pressure on prices. Price range: $349,000 to $4.8 million for residential lots, and homes on the market range from $1,190,000 to $14.5 million. Lot size range: From .1 acre up to 6.57 acres. Mountain Village affords fantastic views from almost everywhere, terrific ambiance, and easy access to the town of Telluride by the free shuttle system and the gondola. Since its founding in 1987, Mountain Village has become one of the most desirable places to live anywhere in Colorado. Near the ski lifts where most of the commercial activity and condos are located.